Family, home, business, life, school, meals, memories....it's all work in progress. For a long time now Chad and I have been ready to build a new home. We’ve built three homes together in the past – two in Georgia and one with Pepper Viner Homes, the company he’s been with here in Arizona for the past 12 years. The house we’re in now has served us well over the past nine years; we moved into it when Maggie was only one month old. The kids are approaching their teen years now, though, and we need a little more elbow room. Over the past couple of years the stress and hassle of commuting to work, school, and activities for all of us has really taken its toll. We started looking seriously at lots about a year ago, and the process of finding a piece of land in the right location at the right price has been much more difficult – and much slower – than we anticipated. More on that later. Another reason – with the housing market on an upswing after several rough years, prices and costs are going up. We’re hoping to get moving along with this process sooner rather than later. Luckily, with Chad having worked in the homebuilding industry for most of his life, we’re coming at this process with a pretty clear picture of what we want to do. We’re excited to be using one of Pepper Viner’s existing floor plans with a few tweaks to customize it for us – that alone will save us time, money, and angst. We know the plans are well-designed and engineered. Our floor plan was built as a model home at one of their communities last year, so after touring it several times, we knew this was the one. It will give us the space we need, with plenty of room for a home office, guest space, and for the kids to hang out with their friends. To sum it up, building a house is the right decision for us because it will save us money, allow us to customize our home, give us the space we need, and allow us to choose our location. We’re so excited to get started – and I’m going to chronicle our process right here. I hope you’ll follow along and chime in with your thoughts, questions, and suggestions as we go! Several years ago, I wrote a little review about a trip we took to Oceanside, California. The funny thing was that we just sort of accidentally ended up there when my husband was looking for hotels near Legoland. We had a great time, but didn't make our way back for several years. Turns out that family friends of ours have a vacation rental in Oceanside. My parents rent the house once or twice a year, and when we can, we tag along for a few days. We went this past year over Labor Day weekend, and had a wonderful time. Oceanside is a laid-back, casual beach town, not nearly as pretentious of some of its ritzy Southern California neighbors. In my book that makes it perfect for a relaxed family getaway. While we love Tucson, the east coast girl in me misses the beach and needs to see the ocean every now and then. This trip to the coast helped us to regroup and breathe a little before we jumped into a jam-packed fall full of school, homework, sports, work, and activities. Because the house we rent is right on the beach, we spend 90% of our time there. We drink our coffee in the morning, watching the surfers until the kids decide to change into bathing suits and begin their day - digging in the sand, jumping waves, collecting shells, and meeting other kids on the beach. Notice I said nothing about watching TV or playing video games - that's the beauty of this vacation; they can keep themselves busy for hours at the beach! At night we sometimes grill out - Fish House Vera Cruz in Carlsbad has a beautiful selection of fresh fish; this year we picked up some swordfish and threw that on the grill, baked some potatoes, and had a fantastic meal while we watched the sun set. Food really does taste better at the beach! We also ate at Hello Betty Fish House for the first time. I loved the casual concept with the big open windows and nice selection of Baja-inspired food. I had fish tacos that were great. After dinner we took a walk on the Oceanside Pier. The pier was pretty crowded in the evening, unlike the times we'd walked it during the day. This year we decided to revisit Jake's Del Mar, a restaurant we had eaten at once before, for another dinner. It's a little drive down the coast from Oceanside, but it's fun to see the scenery down the Pacific Coast Highway if you choose not to take the freeway. The views are spectacular and the servers are very attentive despite the crowds, so all in all it was a nice evening. 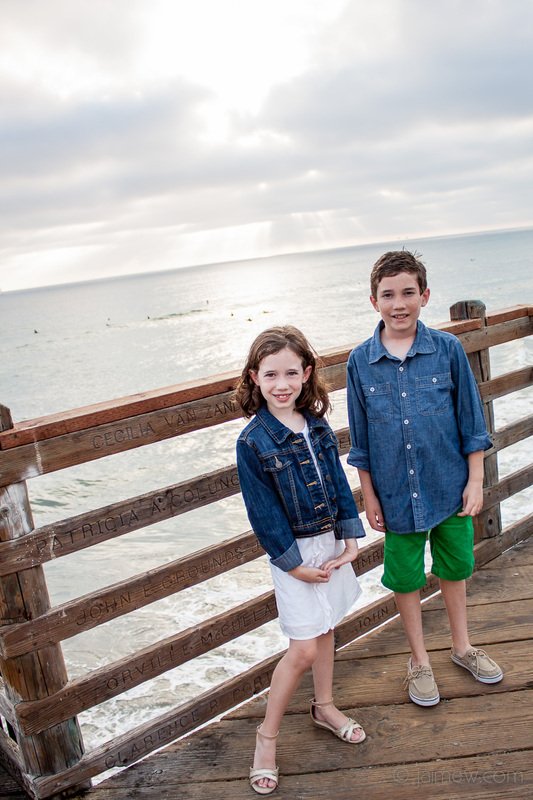 One of our days was spent at Legoland, just a few minutes down the road in Carlsbad. Truthfully, at 8 and 10, my kids are getting to be a little old for Legoland as they're starting to enjoy more daring rides at other theme parks, but my son is still a die-hard Lego fan and my daughter actually won the tickets in a coloring contest by our local TV station, so why not?! The kids found out about their MiniFigure trading program (How did we not know about this before? You can bring your MiniFigures and trade them with park employees.) so they were excited to do that, and it was fun to see the actual set of The Lego Movie in person. My son is still dreaming of the day when he can get the Lego Death Star, so he enjoyed seeing that on the Lego Movie set too. We enjoyed the gorgeous weather and fun family day, so it was a nice outing and added a little variety to the trip. One of our favorite traditions is to end the trip with a big breakfast at Beachbreak Cafe before we load up the car for the long drive back to Tucson. This is a great local place with tons of delicious breakfast options - bring your appetite! That's it for this trip, but we're definitely hoping a return visit to Oceanside is in the cards for 2015. I wasn't completely honest in my last post. I talked about some of my weekend plans, but I didn't mention that we were taking off for a quick trip to California - I'd rather announce my travel plans to the internet after the fact :) . My in-laws joined us for the trip so that we could take the kids to Legoland - their very first theme park. Luke has been absolutely obsessed with legos this year, and a lot of my friends told me that Legoland is perfect for kids their age (6 and 3). We really wanted to take a trip this summer, but we had to do it on a tight budget, and we managed to make it happen! We got a great deal on rooms at the Holiday Inn in Oceanside, CA, which is really close to Legoland. We were especially lucky considering that this was a last-minute plan and a holiday weekend. I was a little skeptical because you can never really tell how a hotel is going to be from the photos on the website; I've been to places before that looked great online, but in person were old and run-down. We weren't going for "fancy and luxurious" here, but we did want "clean and convenient." I can not say enough good things about this hotel. It's a newer hotel, and it was immaculate (HUGE bonus points from me for that!). The rooms were spacious - two queen beds and a little sitting area with a couch, a large flatscreen tv, microwave, and fridge - PERFECT for traveling with children. The staff was exceptionally nice - very patient with my energetic children bouncing around the lobby because they were so excited. They went above and beyond to answer questions, get us anything we needed, and just in general help us out. It was the best hotel experience I've had while traveling with my kids. We'll definitely stay there again. The hotel was a short walk from the beach. It was such a quick trip that we only spent one afternoon at the beach, but the weather was gorgeous and the kids had a blast. Later we got changed and walked to the harbor area for dinner - it was so nice not to have to get back in the car! The next day we headed to Legoland. We all had a fantastic time. The kids loved the rides, and my friends were right - the park is perfect for younger kids. I was a little surprised that Maggie was a little too short for quite a few of the rides, but she had a great time anyway. The park did get pretty packed around lunchtime, so I was glad that we had arrived when it opened and covered some territory before the lines got too long. All in all, it was a great trip - just a little too short. Next time, I'd love to stay a little longer, but the change of scenery was nice and seeing the kids experience something new was really fun. So far I like it; Jennifer Weiner does not disappoint. Maybe it's because she's close to my age, but during flashbacks in Best Friends Forever, she captures little pieces of childhood in the 80s that completely resounded with me. I have a few issues with one character, but I'm going to wait until I finish it to make my final judgement. It's been quite a long time since I've read a Pat Conroy book, but I'm anxious to check it out. I'm sure it will have me reminiscing about living in the Lowcountry...I love Tucson, but I sure do miss the beaches and fresh seafood from our days in Savannah. But not the bugs. I most definitely do not miss the bugs. In an effort to keep myself from eating them all, I packaged some up in little cellophane bags, tied them with a ribbon, and added a cute sticker I made for each of the kids' teachers. I'm sending them to school tomorrow as a random treat. I know in my teaching days, I wouldn't have minded a little mid-week surprise, especially if it involved baked goods. Luke said, "Mom, I think it's nice we're bringing these for my teachers. They've been working really hard." I'm adding this to Kimba's DIY Day and Works for Me Wednesday! The princess party I mentioned a few weeks ago was a success! We did a small family party on Maggie's actual birthday, and she had so much fun that she was confused when I told her we had another party with her friends coming up on the weekend. For her family party, I made the cake (with a little help from the birthday girl herself). I'm not much of a baker, so I used a butter cake mix and added a cup of sour cream — it makes it a little richer, and it was so good! I iced it with a white chocolate icing, using one of the Cake Mix Doctor's icing recipes. If you're like me and don't bake much, her books are such a huge help! The recipes are simple and come out great. Having said that, I have found it virtually impossible to produce a cake that actually looks good (I just have no luck! ), but at least it tasted good. And Maggie was thrilled with the "princess sparkle sprinkles." The family party was low-key and fun, and then I got to work on the "kid" party. I created a cute little invitation design (the princess image came from here) and sent it in an email instead of as a paper invite (I was running out of time, and wanted to give everyone a little notice!). We ended up having the party at a local restaurant. It's a small place that happens to be owned by my dad and brother-in-law, so we picked a low-traffic time, set up the back room with tables wrapped in white paper (from Michael's) and crayons, and played "pin the kiss on the frog" (from Wal-Mart!) on the patio. It was lots of fun. So that's the princess party in a nutshell. Anyone else seen any great kids' party ideas lately? I've added this post to Works for Me Wednesday at We Are THAT Family. Go over and check out all of the great tips! Things have been busy here! Both of my kids started school today. I'm excited and tired and anxious to get settled into a routine. Now go check out the after. Beautiful! Those are exactly the counters I'd love to have! Chad's parents were in town and we ended their visit with a night in Phoenix, since they were flying out of Sky Harbor. Thanks to the suggestion of my friend Paula, we stayed at the Arizona Grand Resort. The rooms were perfect; all newly renovated suites, so the kids had a room with a pullout couch and we had a king-sized bed, and Chad's parents had an adjoining suite. The best part about this hotel is the adjacent water park — the perfect way to survive a July day in Phoenix, because it really is too hot to do anything else. The kids had a blast, though Luke was very bummed to discover that he was too short to ride the water slide. We spent some time floating in the lazy river and swimming in the wave pool, though, and the kids played in the kid area for a while. Dinner was also lots of fun. At the top of the hill near the hotel is the Rustler's Rooste. This was a great family restaurant; absolutely spectacular views of Phoenix, a big metal slide that kept Luke busy the entire time, and a live band that kept Maggie dancing. We spent a long time there and were all good and worn out by the time the evening was over. The next day we headed to the Arizona Science Center. I can not believe that I didn't know this place existed before! They have a ton of fun and interesting hands-on displays, and the highlight of the whole trip for Luke was the Lego area. We had to tear him away when it was time to leave. So even though the budget wasn't going to allow a "real" vacation this year, this little overnight trip was a great way to get a change of scenery, break up the routine, and have some fun with the kids. The funniest part was on the way home when Luke asked, "When will we be back in America?" Get my blog posts delivered right to your inbox by entering your email address below – it's quick, free, and easy! Follow some of my blogging friends!